Shinmachi Street (新町通り) is a historic district located in Omi-Hachiman. There are many traditional Edo Style housese remains since Edo period. Omi-Hachiman was developed by Omi-merchants and Shinmachi Street has the remaining houses of Omi-merchants which now opened for public. When you walk around this street, it offers you the atmosphere of Edo town. There is a parking near this street. Restroom is available at History museum. Shinmachi Street is registered as the historical asset and preserved sites. Some of the traditional houses are used for shops and restaurants, and some of them are opened as museums. 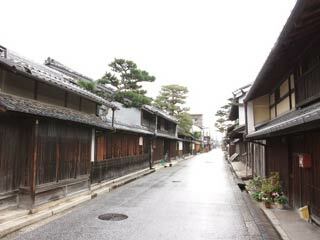 All the traditional house designs which also seen at the houses of Kyoto seen at this street. … was built in 1706. It was used to be Tatami shop and they had a brunch stores in Kyoto, Osaka and Edo. … was built in early Edo period. They sold Tatami, cottons and mosquito net. They had brunch stores at Nihonbashi and Osaka. In 1840, this house was given to the city and became school.